A fresh and unique itinerary 100% overland that finally can be experienced thanks to the opening of the border between Egypt and Sudan! From Aswan, we will sail to discover Lake Nasser, visiting beautiful sites such as Wadi Es Sebua, Amada and Kasr Ibrim, with no tourists at all and far from any political tension in Egypt, until the beautiful temple of Abu Simbel. 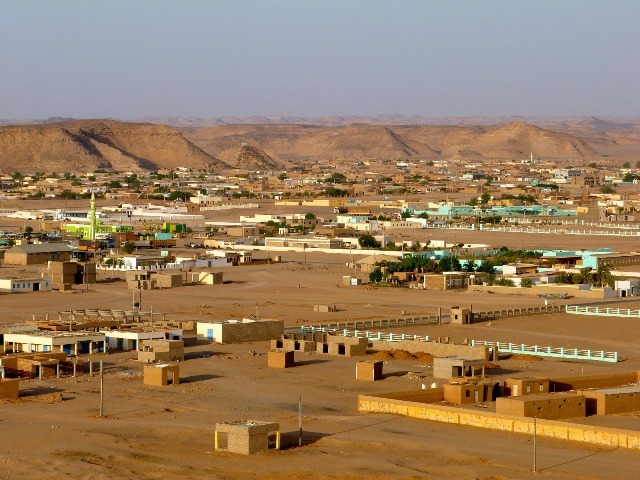 We will then cross the border to reach Sudan and continue with 4×4’s along the Nile to admire and discover the beautiful archaeological sites of Soleb, Tombos, Kerma and also to see the colorful Nubian villages, the Nubian Desert and the Jebel Barkal with its polychrome tombs. 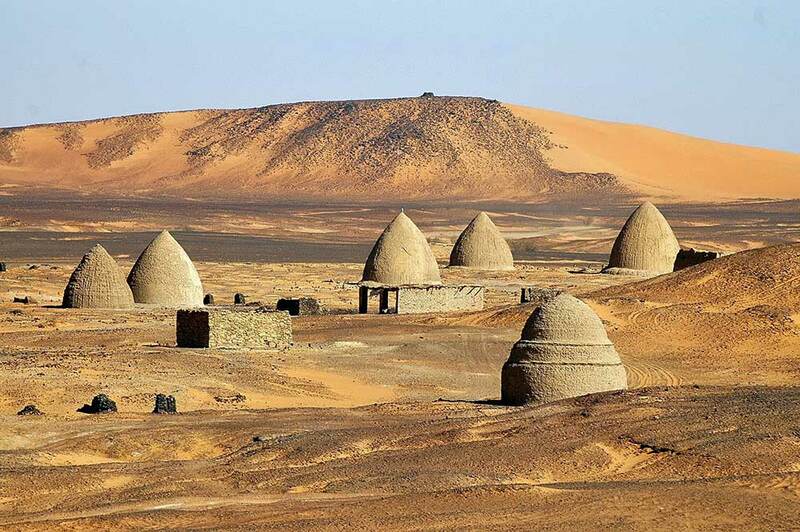 We will then experience the Bayuda desert with its volcanic cones and nomadic settlements up to the astonishing UNESCO site of the Royal Necropolis of Meroe. 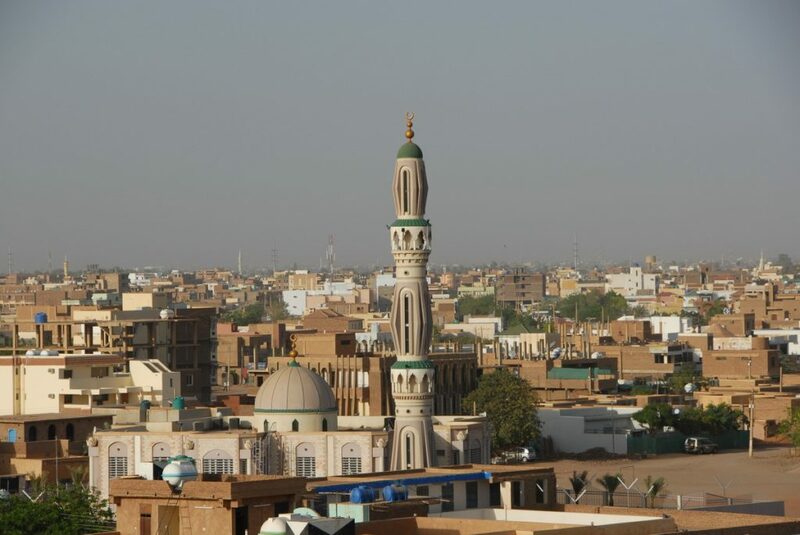 In Khartoum, we will visit the Archaeological Museum and the huge market in Omdurman. 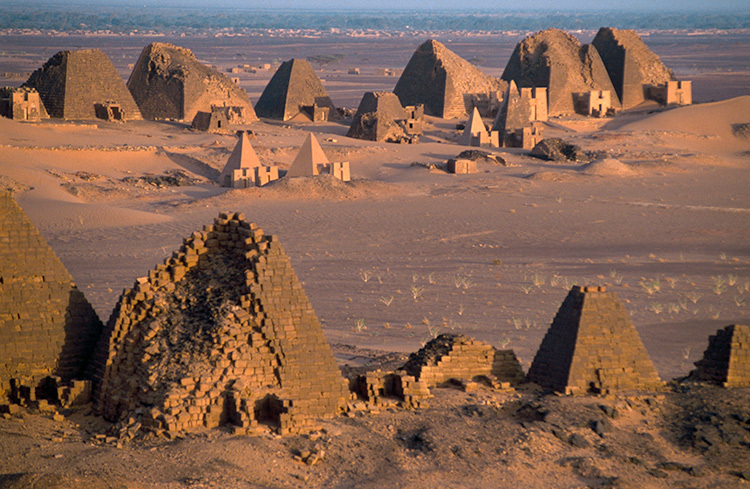 Join us on this adventurous and pioneering route through Nubia and history and experience Egypt & Sudan at its best! LOI (letter of invitation) for Sudan visa. We begin our Egypt tour on arrival into Aswan and transfer to our hotel. Depending on arrival times, we may have an opportunity to tour the city. We will have a group dinner in the evening to go over our program and get to know each other, followed by a visit to the busy Aswan souk night market. Overnight at the Isis Corniche Hotel in Aswan. After breakfast, we will head to the harbor of Aswan, crossing the great Sadd El Ali dam (Aswan Dam). Here we will board our boat and embark on Lake Nasser, which is one of the largest man-made lakes in the world. We first will head to the temples of Kalabsha. Kalabsha Temple, ancient Talmis, was built over an earlier New Kingdom site during the Roman Period for Caesar Augustus. 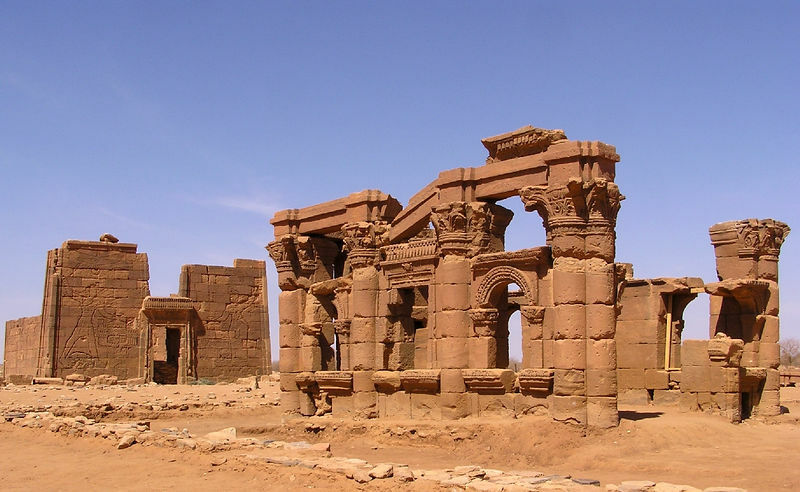 This is perhaps the finest example of a free-standing temple in Nubia and was constructed from sandstone blocks. 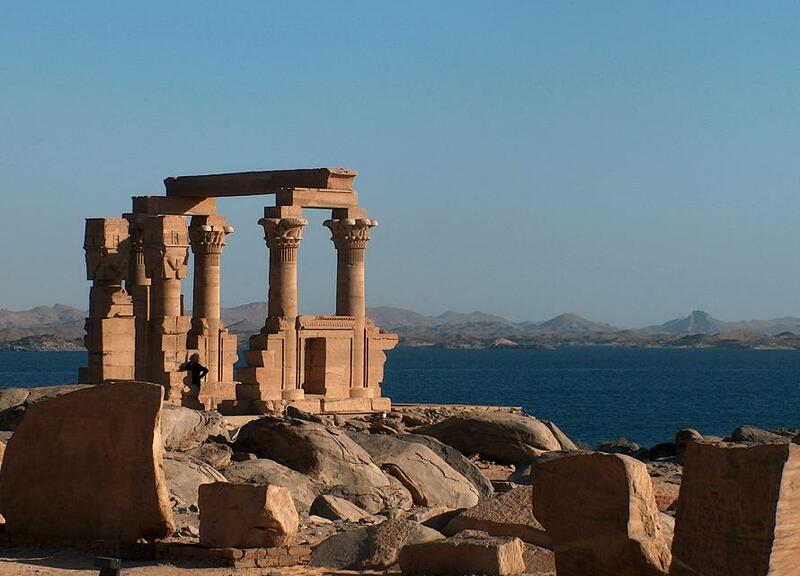 Kalabsha Temple complex is among the most famous of the salvaged monuments on Lake Nasser. It includes the main temple of Kalabsha, Beit el-Wali, Garf Hussein, and the Kiosk of Qertassi. Lunch will be with splendid views of the temples and the high dam. Later, we will reach Boussalem and can enjoy a swim in the lake and optional fishing from the shore (which is renowned for some of the best fresh water fishing in the world). This evening we will take a sunset walk on the Kalabsha archipelago, keeping an eye out for basking Nile crocodiles. Dinner and overnight on the boat. This morning of our Egypt tour, we will start cruising south through the strait of Abu Steit for birdwatching. Then we sail towards Gerf Hussein where we can spot the unfinished holiday palace of Muhammad Anwar el-Sadat, the third President of Egypt. Unfortunately, he was assassinated before ever living in his palace. The famous Egyptian architect Hassan Fathy designed and built the beautiful palace, which has many Nubian features. We then reach Abu Derua, a cone-like hill in the middle of the lake. Dinner and overnight on the boat. After breakfast, we will start the day with a light morning trek along Soqqar Bay (Sugar Bay). Then we continue cruising to Al Madiq to discover some nearby ancient Egyptian engravings. 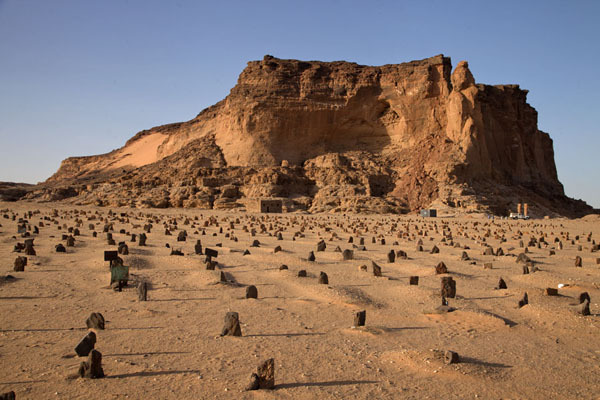 This unofficial site is one of Egypt’s well-kept secrets, and we have confirmation from a famous archaeologist that the date for these engravings is late Predynastic (Nagada II, c. 3500 BCE to about 3100 BCE) to the New Kingdom. The motifs are purely ancient Egyptian. The presence of the Horus emblem (the bird) in particular marks a very early date, as does the low central cabin without a sail. Next we will head south toward the temples of Wadi es-Sebua, Dakka and Maharraqa. Saved from the rising floodwaters of Lake Nasser, the temples sit along the western banks of the lake and include the stunning Temple of Ramses II, dramatically lying half buried in the desert sands and approached along a spectacular avenue of sphinxes which gave the name to Wadi es-Sebua, the valley of the lions. Re-boarding the boat, we will enjoy lunch with views from the upper deck of the temples. We then will take a pleasant walk through the vast dunes of Wadi El Temsah (crocodile bay). One of the most unique places on Lake Nasser where dunes plunge into the lake waters. Dinner and overnight on the boat. After a light breakfast in the shadow of a vast golden dune, we reach Wadi el- Arab, where we will take a sunrise walk in the desert. 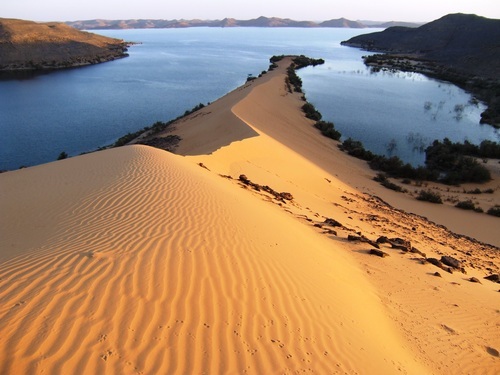 We then head to the dramatic canyons of Korosko, also called the “Nubian fjords”, on the other side of the lake which is only 2-3 km wide at this place. 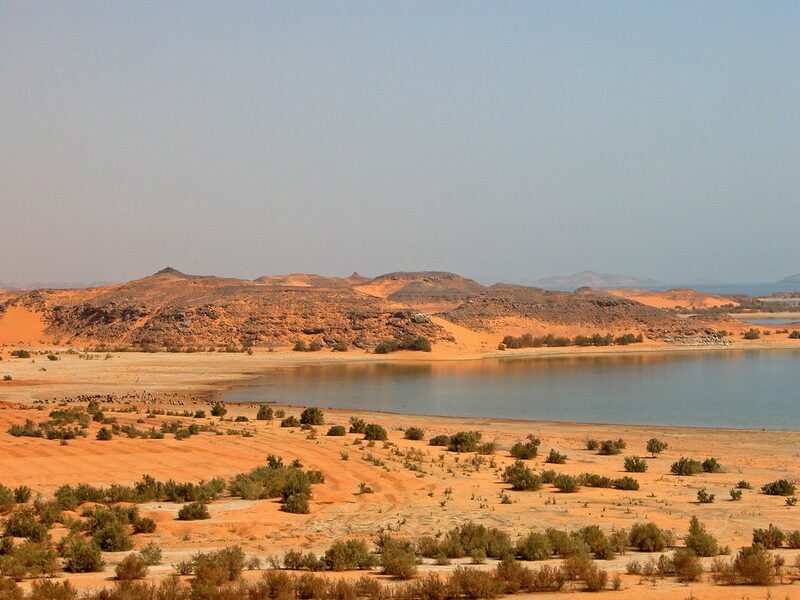 This stretch of the lake provides an ideal spot to look out for birds and other animals living on the shores of Lake Nasser as we meander through the narrow confines of the gorge. We then cruise on, heading next towards the wonderful sandy beaches of El Marsan. Here we will have the opportunity for swim in stunning clear waters of the Nile. We will end the day with an incredible sunset walk with a great view of the vast lake and desert. Dinner and overnight on the boat in a creek not far from Amada temples. This morning of our Egypt tour, we will take a walk through the desert to reach the temple site of Amada. Dating back to the XVIIth dynasty, these are the oldest monuments to survive the creation of the lake. Relocated by a team of French engineers, the complex includes some of the best-preserved inscriptions left in ancient Egypt and this morning we will pay a visit to the temples of Amada and Derrand the tomb of Pennout. Later, we will enjoy breakfast on board while sailing towards Qasr Ibrim, the only monument to have remained in its original location when the lake was flooded. We will have the privilege of visiting these ruins by foot, which are normally not accessible to the public. For one month a year, archaeologists come on a mission to this mysterious place. 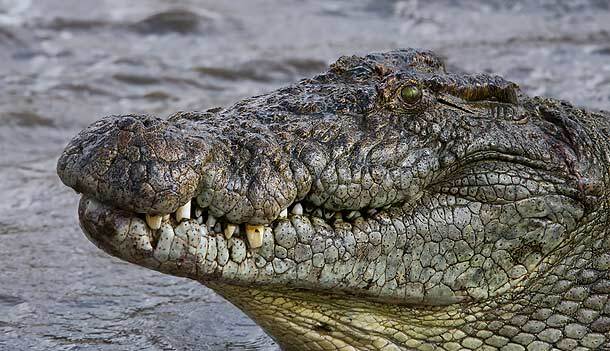 In the afternoon, we will start sailing towards Toshka Island that we should reach in the evening around sunset, where we may have another chance to see crocodiles on the sandy shores of this huge island in the middle of the lake. Dinner and overnight on board. Today on our Egypt tour, we start crossing Toshka Island by foot, enjoying the desert scenery and wonderful morning breeze, where the skies above often echo with the sounds of dozens of black hawks. The boat will catch us on the other side of the island where we will enjoy a last opportunity to swim in the lake and prepare our luggage for Abu Simbel. 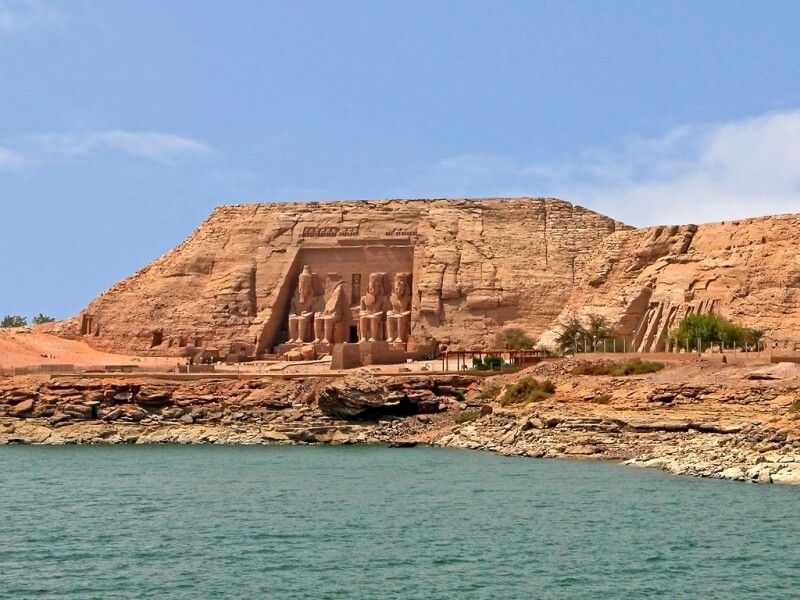 After one and a half hour sailing and lunch, we will reach the harbor of Abu Simbel where we disembark the boat. 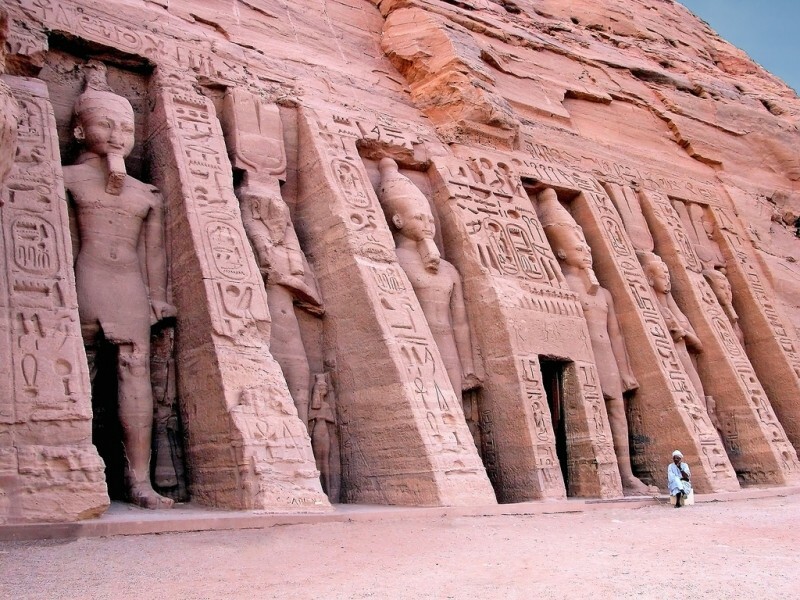 Here we head for the famous rock-cut temples of Abu Simbel. 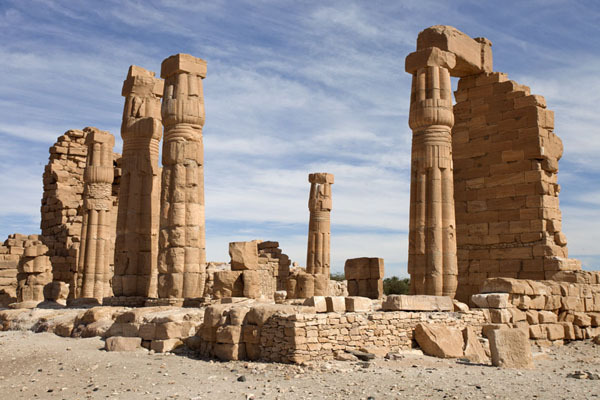 A UNESCO World Heritage Site, these spectacular ruins were constructed by Ramses II. Without a doubt one of the most powerful of the New Kingdom Pharaohs, which includes the four iconic 20 meter high statues of the great pharaoh himself. 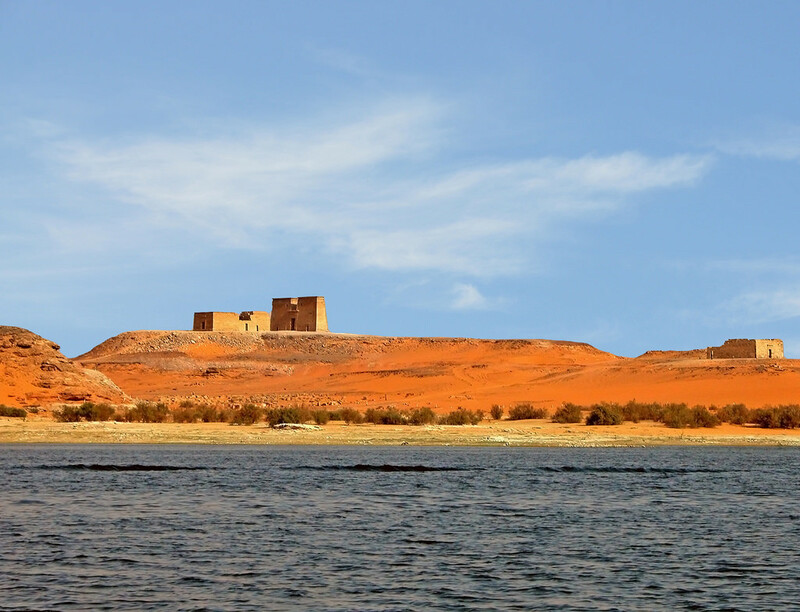 After the visit, we will check into a small but charming eco-lodge on the shores of Lake Nasser. Overnight in Abu Simbel. We take the first bus in the morning coming from Aswan and going to Wadi Halfa, the beginning of our Sudan tour. We will then take the ferry across Lake Nasser to reach the Ashkit-Qostol border checkpoint. After passing the Egyptian border, and once we have cleared the formalities to enter Sudan, we shall meet our Sudanese guides and vehicles which will accompany us for the rest of the journey. Please bear in mind that crossing the border might take a few hours. Dinner and overnight in a simple and basic Nubian house. After breakfast, we will start driving south along the Nile. We will stop near the island of Saï, one of the largest islands in the middle Nile, to take a short cruise on the Nile to see the Nile crocodiles and to reach the ruins of an Egyptian temple and an old Ottoman fortress on the island. We shall then continue southward until the small village of Wawa. Here at sunset, we will take a small motorboat to reach the temple of Soleb, the most beautiful Egyptian temple in Sudan. Later we will return to Wawa. Dinner and overnight in a simple and local Nubian house. This morning on our Sudan tour, we will reach the Third Cataract, which used to be the third huge obstacle that the ancients Egyptians had to face when trying to sail on the Nile River. We will walk up the hill to the ancient Ottoman Fort where we can have beautiful views of the cataract. 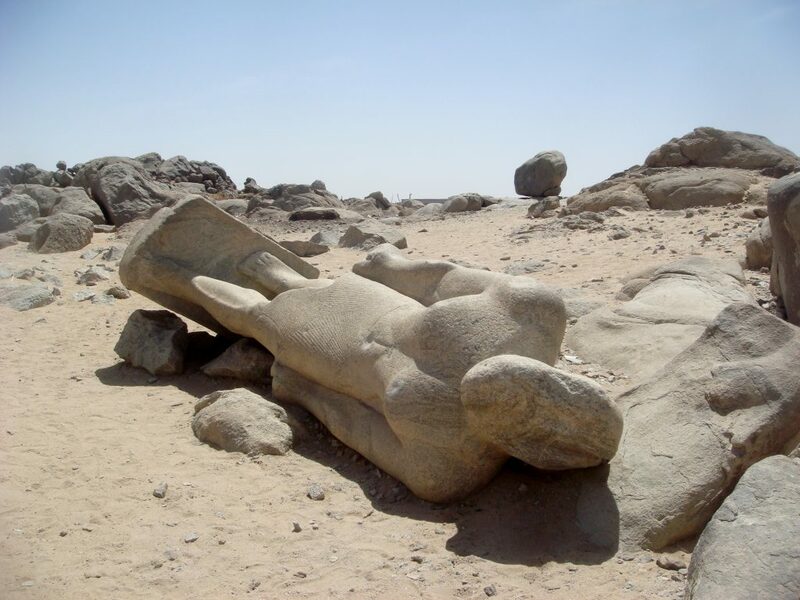 In Sebu, right on the river bank of the Nile, it is possible to visit one of the richest sites of rock engraving in all of Sudan with hundreds of images from prehistoric to Egyptian times. Next, we will then reach the ancient granite quarries of Tombos where we shall also stop for lunch. In the afternoon, we arrive in Kerma where we visit the majestic “Defuffa” the monument that characterizes Kerma civilization. The museum is interesting, as it was created by a Swiss archaeological mission after the recovery of seven statues of the Black Pharaohs in 2003. 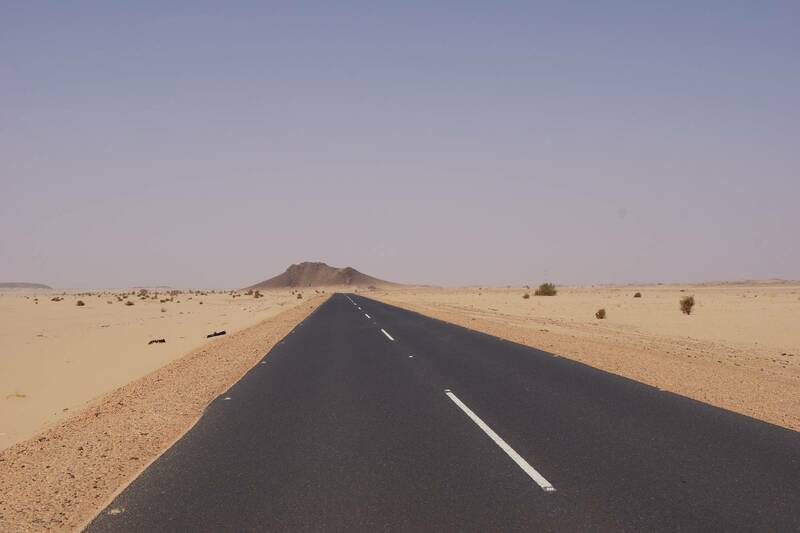 We continue across the Nubian Desert and will camp among the beautiful barchan dunes. Dinner and overnight in wild camp in the desert. 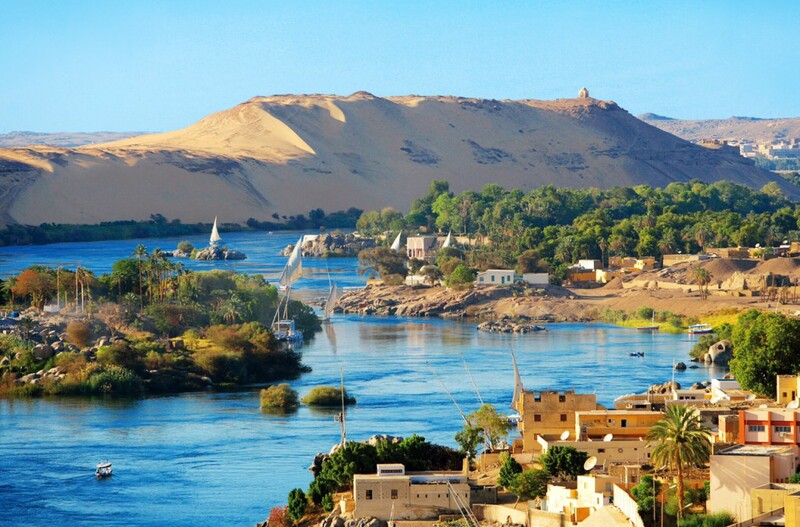 We continue our journey along the Nile and the central part of the Nubian region. Here the population lives in small villages among yellow sand dunes and palm trees. They speak a different language from the Arabs and also the Islamic religion is not as “strict” as in other regions — as the women don’t cover their faces and readily speak to foreigners. Some houses in the Nubian Villages are painted and decorated with colorful patterns and flowers. Enthusiastic hospitality abounds, and we should be invited in to visit their home and share a meal or a cup of spiced tea. We will then reach the archaeological site of Old Dongola. Here are the rest of a Christian Coptic temple with marble columns as well as several suggestive ruins of churches situated on the banks of the Nile. Dinner and overnight at the charming Nubian Rest House, which is a small hotel built in the typical Nubian style just at the foot of Jebel Barkal, the holy mountain of the old Egyptian and Nubian Pharaohs. In the village of El Kurru, there is one of the necropolises of the ancient capital, Napata. 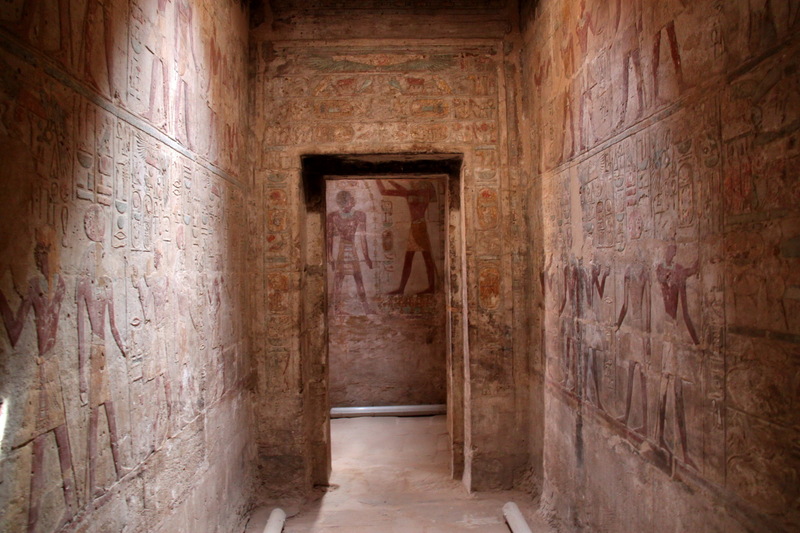 Here we can visit one tomb, which is excavated in the rock under pyramids – partially collapsed – and are entirely decorated with images of the Pharaoh, of the gods and multicolored hieroglyphic inscriptions. Not far from here there is an interesting site of petrified wood, which is an ancient forest with hundreds of massive trunks. We shall then reach the village of Karima at the feet of Jebel Barkal. A true landmark in the Nubian Desert, the UNESCO-listed Jebel Barkal (“Jebel” means mountain in Arabic) can be seen from a few dozen kilometers away while still in the open desert. 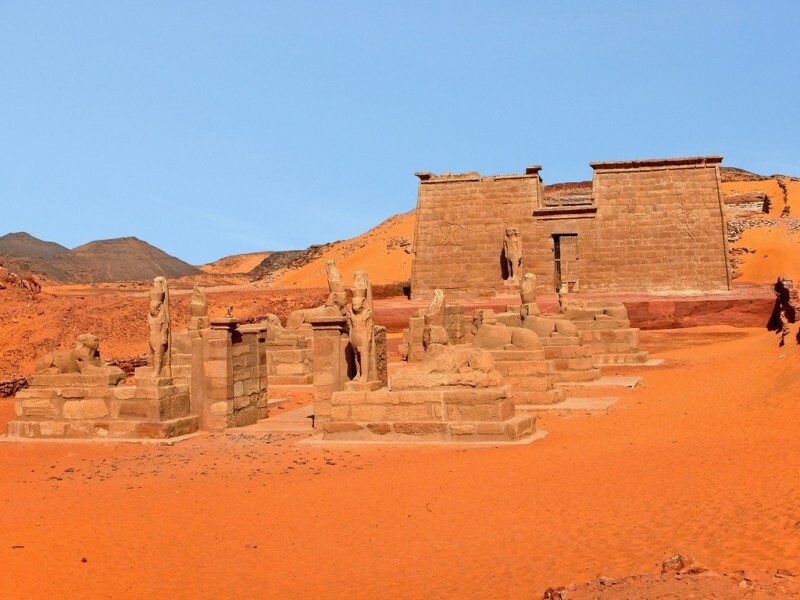 At the foot of this magnificent and isolated red sandstone mountain, considered holy since the ancient times, there is a big temple, dedicated to the Pharaohs of the New Reign and their patron, Amon. 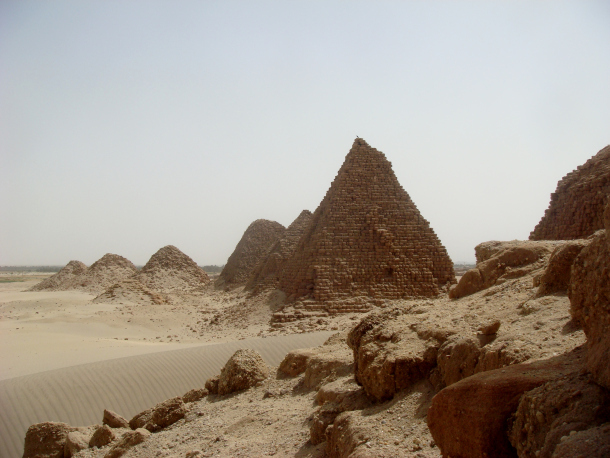 Amon’s ancient “Pure Mountain”, the Olympus of the Nubians, was the spiritual Nubian heart for more than 1000 years. 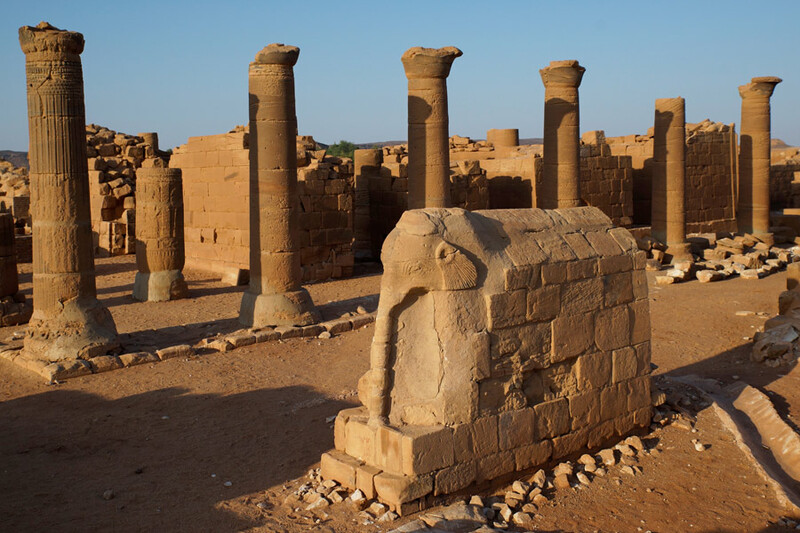 Besides the ruins of the big temple, there are still several sculptured granite rams that were supposed to border a long avenue that probably led to the pier on the Nile. In the mountain wall, there is a big room decorated with bas relief. Later we cross the Nile to reach the pyramids of Nuri and will take a walk among those ancient ruins and then enter the Bayuda Desert. Dinner and overnight in wild camp. 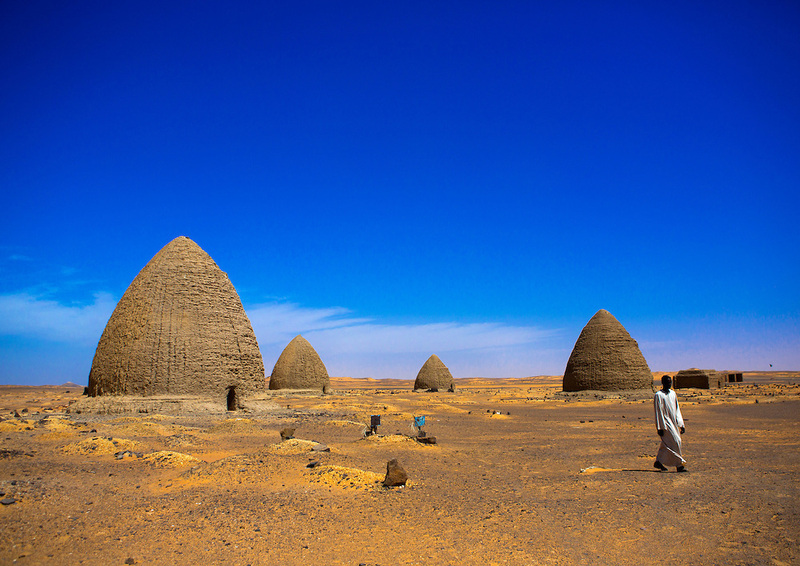 Today on our Sudan tour, we cross the Bayuda Desert, the area bounded by the loop formed by the Nile between the 4th and the 6th Cataract and characterized by sharp, black basalt mountains, most of them volcanic and typically cone-shaped. They alternate with level pebble stretches and broad valleys crossed by dry wadis, where little vegetation can be seen. It is very likely to meet isolated groups of Hassanya Al-Manasir nomads, who live in groups in small huts made of intertwined branches close to the rare water wells, with their caravans and herds of camels and cattle. Just in the center of the Bayuda Desert we reach Atrun Crater, where nomads gather salt from the edge of a green colored pool. They collect the salt and load it on camels or donkeys, then move in small caravans to sell it into the markets of the villages along the Nile. We finish crossing the Bayuda and then cross the Nile on a local ferry-boat. These ferries are a buzz of colorful activities. We find ourselves sharing space with people, donkeys, camels and goats. On the other shore, we will drive until we catch our first glance at more than 40 pyramids, located on top of a hill, that belong to the Royal Necropolis of Meroe. 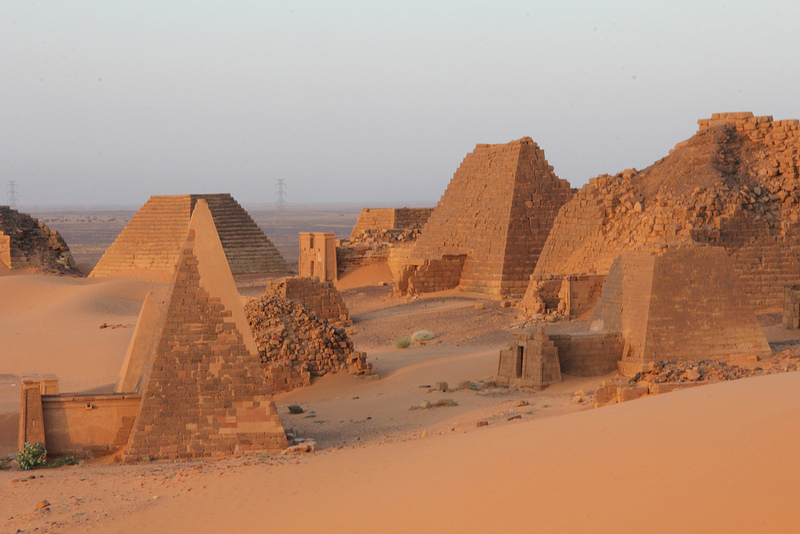 Later we will arrival at the Meroe Camp, which stunningly overlooks the more than forty pyramids. Accommodation in comfortable and fully furnished tents and each one has its a private bathroom hut with shower and toilet. After breakfast in camp, we stop in the town of Shendi to visit the colorful and lively market. Then we will continue our journey visiting the two nearby archaeological sites. The site of Musawwarat es-Sufra is located in a beautiful valley crowned by hills. Here the ruins of an enormous temple are visible; it once played an exceptionally important role. Its main characteristic, the “Great Enclosure” is made by many constructions and boundary walls which surround a temple built in the 1st century A.D. Beyond the big wadi there is another temple – restored by a German archaeological mission – dedicated to the god Apedemak. We then go to Naga, which is located about 30 km to the east of the Nile and is one of the two centers that developed during the Meroitic period. In Naga, in a typical Saharan environment with rocks and sand, we find a temple dedicated to Apedemak (1st-century A.D.): a wonderful building with bas relief decorations depicting the god with a lion’s head, the Pharaoh, noblemen and several ritual images. A few meters away there is a small and odd construction with arches and columns, named “kiosk”, in which we can notice Egyptian, Roman and Greek styles, all at the same time. Not far away we will reach another temple dedicated to Amon with many statues of rams and beautiful gates decorated with bas reliefs. In the late afternoon, return to the Meroe Camp. Breakfast in camp and then we visit the Royal Necropolis of Meroe, one of the highlights of our Sudan tour, which is located about 3 km away from the Nile on some hills covered by yellow sand dunes. Several pyramids stand out with their sharp shapes against the clear sky. Each one has its own funerary chapel with the walls entirely decorated with bas reliefs that show the King’s life and offers to the gods. Then we continue the journey southward towards Khartoum until we get into a desert area covered with huge, round granite boulders; these are the last offshoots of the rocky formations of the 6th Cataract. In the afternoon arrival in Khartoum where we will have the evening to relax at leisure. Overnight in Khartoum. 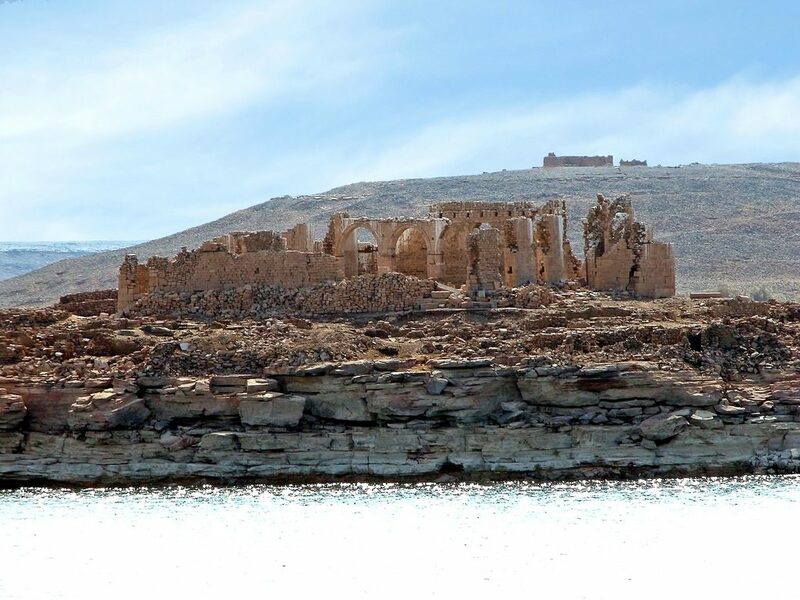 On our last day of our Sudan tour, we will visit the Archaeological Museum that, besides many beautiful objects, contains two beautiful temples rescued by UNESCO and moved from the Lake Nasser area, when it was flooded by the water. 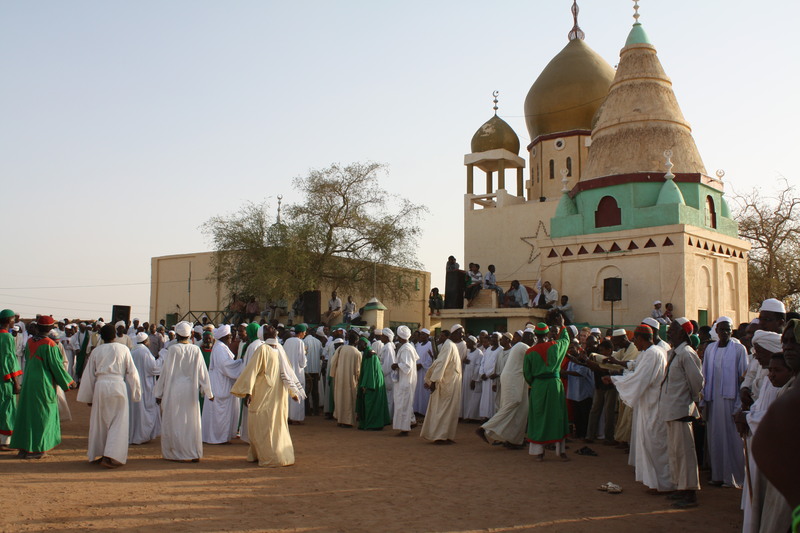 In the afternoon, we will then visit Mahdi’s tomb from the outside and, time permitting, the Khalifa’s House Museum in Omdurman. Later we visit the largest souk in Sudan, which is a very interesting experience. At sunset, we will head out near the tomb of Ahmed Al Nil to assist in a ceremony of the Whirling Dervishes. Farewell dinner at a local restaurant.